Roz Cummings and the crew at Down South Camping and Outdoors ( pictured ) hosted a great gig last Saturday arvo with Recfishwest. Unfortunately, I was unable to attend this VIP information and shopping session as weekends are work days for me, so I was teaching up in Bunbury. Many keen local fishos were able to attend, snap up some bargain fishing gear and with lots of prize giveaways, it was very well received. You can never go to enough knot and rig tying sessions, as techniques keep improving and of course picking the brains of Recfishwest and Down South staff can only add to your chances of bringing home a feed or maybe just fishing better for sport. 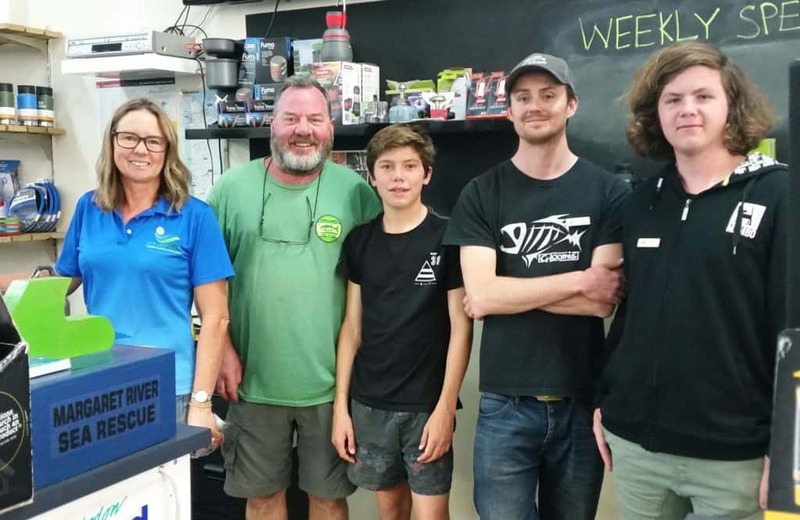 In way of support for the local community, Roz organised a raffle for Margaret River Volunteer Marine Rescue on the day with Group secretary Michael Beasley attending and drawing the winning prizes. Thanks to all those who organised and attended this day, which is hopefully an annual event on the calendar. Similar events have been recently held by Furuno electronics staff in Bunbury and Busselton and last week I finally met someone who attended and passed on some redo hot information on sounder settings. If you are still just using the auto setting on your sounder, then it’s time to step up, get the most out of your equipment, see a whole new world of bottom readings and highlight those fish you have been driving over for years. Firstly, go to your range settings and set them in small increments of about 7-10 metres max. You will probably note that the last 3 or 4 of these settings are in the 200 metre plus range, which is just wasted if you never venture out this deep. Then, once you are fishing in say 40 metres of water, adjust the shift setting so you are only viewing the water column from 30-40 metres, instead of viewing from 0-40 metres in auto mode. Then it starts to get interesting and you may need the manual to adjust the next settings, but it is well worth the trouble. Instead of a white background, set the palette to black, which shows the colors way better, but can be a little tricky when wearing polaroids, so be sure to have those reading glasses on hand when fishing. Now comes the list of additional settings which you can play with in different depths. Pic Advance x 1, Zoom Mode-Bottom Lock, Shift-as described above, Interference-Off, Color Erase-15%, Clutter-30%, White Line-0%, TVG-Medium, Smoothing-Off, TX Power-Auto, TX Rate-Max. And there you have it. For anyone seriously interested, flick me a text on 0409 549 356 and I can send you a screen shot to make it easier when you are out on your boat. Finally, with summer looming, Sea Soaring Marine is doing a special on Xmas skipper’s ticket gift vouchers for the Margs, Cowtown and Augusta areas only, with $30 off if you mention you read these weekly articles in the Mail when purchasing.